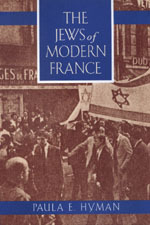 The Jews of Modern France explores the endlessly complex encounter of France and its Jews from just before the Revolution to the eve of the twenty-first century. In the late eighteenth century, some forty thousand Jews lived in scattered communities on the peripheries of the French state, not considered French by others or by themselves. Two hundred years later, in 1989, France celebrated the anniversary of the Revolution with the largest, most vital Jewish population in western and central Europe. Paula Hyman looks closely at the period that began when France's Jews were offered citizenship during the Revolution. She shows how they and succeeding generations embraced the opportunities of integration and acculturation, redefined their identities, adapted their Judaism to the pragmatic and ideological demands of the time, and participated fully in French culture and politics. Within this same period, Jews in France fell victim to a secular political antisemitism that mocked the gains of emancipation, culminating first in the Dreyfus Affair and later in the murder of one-fourth of them in the Holocaust. Yet up to the present day, through successive waves of immigration, Jews have asserted the compatibility of their French identity with various versions of Jewish particularity, including Zionism. This remarkable view in microcosm of the modern Jewish experience will interest general readers and scholars alike. Paula E. Hyman is Lucy Moses Professor of Modern Jewish History at Yale University and author of numerous books. Most recently she coedited (with Deborah Dash Moore) the prize-winning Jewish Women in America: An Historical Encyclopedia (1997).